Moisture control is the key to mold control. Mold will not grow in a dry environment. This article explains the importance of conditioning the air and also discusses options for persistently damp areas. If you don't keep your home dry, moisture in the air will cling to dust in the air. Soon, this moist dust will adhere (cling) to building materials in your home (or commercial building). When mold spores in the air come in contact with the moist dust clinging to walls, floors or ceilings, mold will begin to grow. There is a simple solution to avoid costly mold growth in your home (and other buildings): Keep the air dry! During the humid months of the year, you should operate an air conditioner, a dehumidifier, or both, throughout your house, and particularly in your basement. Vent your appliances such as gas stoves and clothes dryers (especially dryers), to the outside if possible. Run exhaust fans or open windows in your bathroom while showering, or in your kitchen while cooking, dishwashing, and engaging in any activity that produces steam or releases moisture into the air. When you have a leak in a floor, you must act quickly. In most cases, mold will not grow if wet or damp areas and materials are dried within 48 hours of the leak. Crawl spaces that tend to remain damp are one of the most challenging situations homeowners face in the fight to prevent mold growth in a residence. If you have one or more crawl spaces that are persistently damp, professional help is likely to be your best option. If mold is already present, contact a professional mold remediation company to address the problem. To prevent mold from growing in these difficult-to-reach areas, a remediation expert can discuss options to encapsulate and de-humidify the crawl space. Mold only grows where organic matter is present. In damp areas where mold persists, removing organic materials may be your best option. If you've tried the suggestions above and still have persistent mold growth, it may be time to replace your organic building materials with mold-proof building materials. Interior walls of your home are usually constructed with paper-covered drywall. The paper cover is organic material. Replacing paper-covered drywall with paperless drywall eliminates this organic material from the mix. Speak to your mold remediation expert or home contractor about paperless drywall and other mold-proof building materials. If you upgrade to paperless drywall in areas that are always damp, it is still important to keep the surface clean, because in a damp enviroment, mold can grow on any organic debris that accumulates, including pet dander and lint from clothing. Keeping the air dry is always the best way to prevent mold growth in your home (or office). 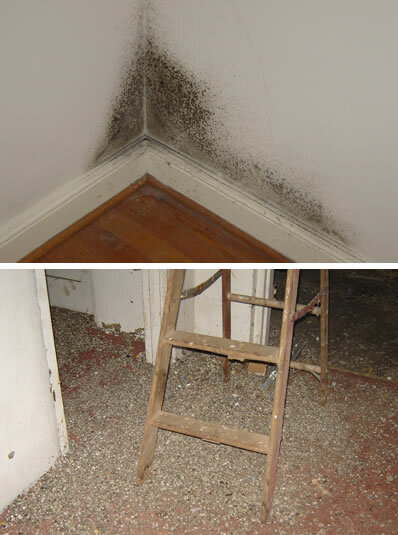 Mold will not grow in a dry environment. In areas that are impossible or impractible to keep dry, consider retrofitting with mold-proof building materials such as paperless drywall. But remember, mold can still grow on these surfaces if they are not kept free of organic debris.